If you want to get creative, make surplus income, be in control of your own hours, and potentially even change the world, then maybe it’s time to make the career change to freelance writing. According to the U.S. Bureau of Labor Statistics, employment of writers and editors is expected to rise 8 percent from now until 2018. Thanks to the Internet and its millions of writing outlets, demand for freelance writers is higher than ever. Don’t get left out of this burgeoning field — you too can successfully start writing for a variety of newspapers, magazines, and online sources, all within the next month. Whether you want to pursue a writing degree or begin writing your query letter today, this book has the answers you need to get started. This step-by-step guide will take you from your first paycheck to your ultimate goal: a career as a professional, full-time freelance writer with a byline that people will recognize. You can easily make thousands of dollars every month, simply by doing what you already love. Even if you have never been professionally published — and even if you don’t have a degree — you can learn how to hone your interviewing, editing, and writing skills to meet the needs of numerous print and online publications that boast millions of readers. Get the recognition your writing deserves with this detailed and easy-to-read book that explains it all. 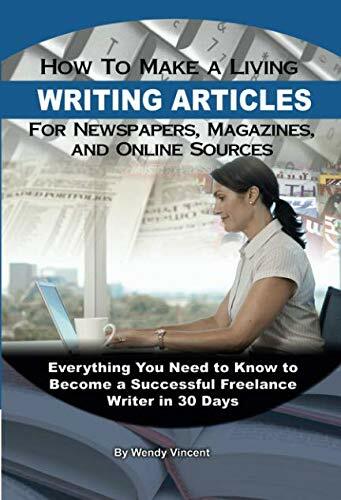 In How to Make a Living Writing Articles, Newspapers, Magazines, and Online Sources, learn how to pitch your first story idea to any publication and get it printed — and get paid. Learn how to submit queries and write a diverse variety of professional-level articles that news, entertainment, and niche publications will eagerly pay you for. You will find out how to utilize blogs, social networks, and search engines to find the best publishing opportunities, as well as how to market yourself online to attract editors to your talent with a personal Web site and online portfolio. Composing a contract, writing a query letter, and formatting a payment invoice are all subjects covered within book. Worried about falling for job scams or getting confused by copyright laws? This thorough book will teach you how to discern the too-good-to-be-true ads from the genuine opportunities, and you will learn everything there is to know about modern copyright laws, including laws concerning the online market. In less than 30 days, you’ll know how to maintain long-lasting and meaningful relationships with editors and publishers, how to effectively communicate with them via e-mail or telephone, and how to find the most credible and accurate sources for researching all of your assignments. You will become familiar with most common style manuals, such as the Chicago Manual and the Associated Press Stylebook, and you will learn how to format your story — whether for publication in HTML, print, or for an e-reader. If you’re feeling shaky about your interviewing skills, How to Make a Living Writing Articles, Newspapers, Magazines, and Online Sources will reassure you with hundreds of tips for staying professional and confident during all telephone, e-mail, and in-person interviews, no matter how daunting or sensitive the story topic. Throughout this step-by-step guide, you will find trusted advice from industry insiders and writers who know exactly how to pitch, pen, and publish a story. Dealing with feedback, knowing the ethics and legalities of confidential sources, writing compelling headlines — it’s all covered in this book. Learn how to take advantage of hot new online resources that have broadened publication opportunities more than ever before, and get advice on how to make your own hours and stay motivated. Earn the most money possible for your original articles, whether you are paid by the word, page, or story. Get familiar with the publishing industry and adapt your writing to suit any medium, including blogs, press releases, and online-based newspapers. With this book as your guide, you will learn how to organize and use your writing talents the right way — and support yourself doing so.